12 Days into the Games: African Olympians thus far…. I just wanted to give you an update on all our African medalists at the 2012 London Olympics. Taoufik Makhloufi, of Algeria, won Gold in the 1500m Men yesterday, after a display of courage and determination. He was disqualified on Monday for not putting enough effort in the Men’s 800m qualifiers, and then later on reinstated, and went on to winning Gold in the 1500m. Such drama! Abdalaati Iguider of Morocco won the bronze in the 1500m Men, after Taoufik. Tirunesh Dibaba, the baby face destroyer, destroyed her competitors on the 10,000m women’s race. It was lovely to watch her sprint to the finish. We long for a repeat on the 5,000m women’s race which will take place this Friday. The Kenyans Sally Kipyego and Vivian Cheruiyot won silver and bronze respectively. On the men’s 10,000m, Kenenisa Bekele disappointed us. Frankly all Africans top runners disappointed us. It was mostly a show of African top runners elbowing each other to stop the other from winning (Kenyans, Ethiopians, and Erythreans) and cornering Kenenisa… and that’s how the British-Somalian Mo Farah won. Basically, our brothers just went for the ‘crab’ politics. Disappointing! Tariku Bekele, Kenenisa’s brother, saved the day by winning the bronze medal. The Men’s 3000m Steeplechase was won by Ezekiel Kemboi of Kenya who took gold, while another compatriot, Abel Kiprop Mutai took the bronze. 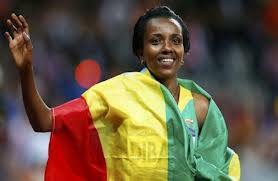 In the women’s 3000 m Steeplechase, Sofia Assefa of Ethiopia won the bronze medal. The Women’s marathon was won by Tiki Gelana of Ethiopia who set a new olympic record, and was followed by Priscah Jeptoo of Kenya with silver. As said earlier, Alaaeldin Abouelkassem of Egypt won Silver in Men’s Foil Fencing. In swimming, Tunisian Oussama Mellouli took Bronze in the Men’s 1500m freestyle. South African Chad le Clos took Silver in the Men’s 100m butterfly, and gold in the Men’s 200m butterfly. Cameron van der Burgh, another South African, won the gold medal in the Men’s 100m breaststroke. In rowing, the South Africans James Thompson, Matthew Brittain, Sizwe Ndlovu, and John Smith, captured gold in the Men’s Lightweight Four, thus winning South Africa’s first rowing medal. Great tremendous issues here. I am very happy to see your post. Thanks a lot and i’m looking forward to touch you. Will you kindly drop me a mail?